The height of the doll is 32 cm. Starting from the bottom row with shoes, from the right sole, with a black thread, dial 25 pet. 1 row: increase in each loop = 50 pet. Starting with izn. row, knit 5 rows. Black thread to break off, attach the red. Knit 6 rows of stockings. Cut off the red thread, attach the light blue to the stocking. the next. row: 5 persons., (2 vm. persons.) 16 times, 13 persons. = 34 pet. Knit a number of life. loops. Track. row: 4 persons., (2 vm. persons.) 9 times, 12 persons. = 25 pet. Knit 29 rows of stockings, cut the thread, leaving a loop on the spare needle. Knit as right up *. Next. Rd: 13 persons. (2 vm. persons.) 16 times, 5 persons. = 34 pet. blue thread, attach a light yellow to the bottom of the body (pants). With faces. hand knit 25 pet. with the left foot facial, then 25 pet. with the right foot with spare needles. = 50 pet. Knit 15 rows of stockings. Cut off the yellow thread, attach the blue to the upper body. Knit 18 rows of stockings. Tear off the blue thread, attach the cream for the head. Tie 2 rows of stockings. Next a row: 10 persons., an increase in each of a trace. 18 pet., 10 persons. = 56 pet. Track Next Row: (2 vf. faces. to the end. = 28 pet. Knit a series of worn loops. thread, leaving a long end, pull through the loops, not pulling. there. Sew each leg at the ends of rows. The left leg is sewn a mirror. Remove the doll available. shoes, feet, then body and lower face. of the head through the open hole at the top. Having finished packing, pull the thread, fasten. thread, starting from the top edge of the frill, dial 28 pet. 1 row: increase in each loop. = 56 pet. * 2 row: 1 person., (Stretch the thread from below over the right knitting needle, making a loop, 2 vm. Persons.) To the last loop, 1 person. Knit 2 rows of garter stitch. Hinges close. from yellow thread. Sew on. Use a red thread to dial 36 pet. and knit 2 rows of stockings. Close the loop as purl. purple thread, starting from the bottom edge of the skirt, dial 130 pet ..
Knit 2 rows in garter stitch. Now continue knitting stocking knitting, attaching another color thread. Knit in 2 rows. The alternation of colors: blue, green, yellow, orange, red, purple *. Repeat these 6 color bars again. Next, knit 2 rows of blue, green, yellow and orange. Track. a row: a red thread (2 vm. persons.) up to the end. = 65 pet. Continue to knit with red garter thread for 2 more rows. Hinges close. SKIRS Sprinkle skirt with water, spread out, straightening. Let it dry. Sew on the ends of the rows, turn out there. The edge of the closed loop to put on the doll and sew to the first row of blue body threads, the seam of the skirt behind. Cream thread, starting from the bottom edge, dial 11 pet. 1 row: add 1 pet. in every loop. = 22 pet. Starting with izn. row, knit 13 rows of stocking. Cut off the cream thread, attach the blue to the sleeves. Knit 18 rows of stockings. Reduce 1 pet at the end of each row. every other second row 6 times. = 8 pet. Sew the sleeves at the ends of the rows to the head. Then sew the bottom of the looped loops. Turn out there. To stuff. Sew the upper edge of the sleeves to the doll, positioning the edge of the closed loops just below the neck. For the wrists, thread one cream-colored thread through the loops around the wrist. Lightly stretch, fasten the ends into a knot. Hide the ends of the threads. Light blue thread, starting from the bottom of the frill, dial 20 pet. 1 row: add 1 pet. in every loop. = 40 pet. Next, knit according to the description of frill pants from * to the end. Sew ruffles at the ends of the rows, sew to the first row the sleeves of blue threads on the wrist. Gather 7 loops with two threads of different shades of beige. 2 row: persons. to end. Repeat these 4 rows 51 more times. Then close the loop. With the same thread, dial 8 pt. Knit garter stitch 29 cm length from the beginning. Hinges close. With the same thread, dial 64 pts and knit 1 row with face loops. Track. a row: (6 persons., 2 vm. persons.) up to the end. = 56 pet. Knit 2 rows of garter stitch. Track. a row: (5 persons., 2 vm. persons.) up to the end. = 48 pet. Knit 2 rows of garter stitch. Track. row: (4 persons., 2 vm. persons.) to the end. = 40 pet. Knit 2 rows of garter stitch. Track. a row: (3litz., 2 vm. persons.) up to the end. = 32 pet. Knit 2 rows of garter stitch. Track. row: (2 persons., 2 vm. persons.) to the end. = 24 pet. Knit 2 rows of garter stitch. Track. a row: (1 persons., 2 vm. persons.) up to the end. = 16 pet. Cut the thread, leaving a long end. Stretch it through the remaining hinges, tighten. around the edge of the typed and closed hinge field hinges. Also sew the side of the hat. Sew along the long side of the field with the sidewall. Sew along the ends of the rows the bottom of the hat. Next, sew the outer edge of the bottom to the second side of the sidewall. 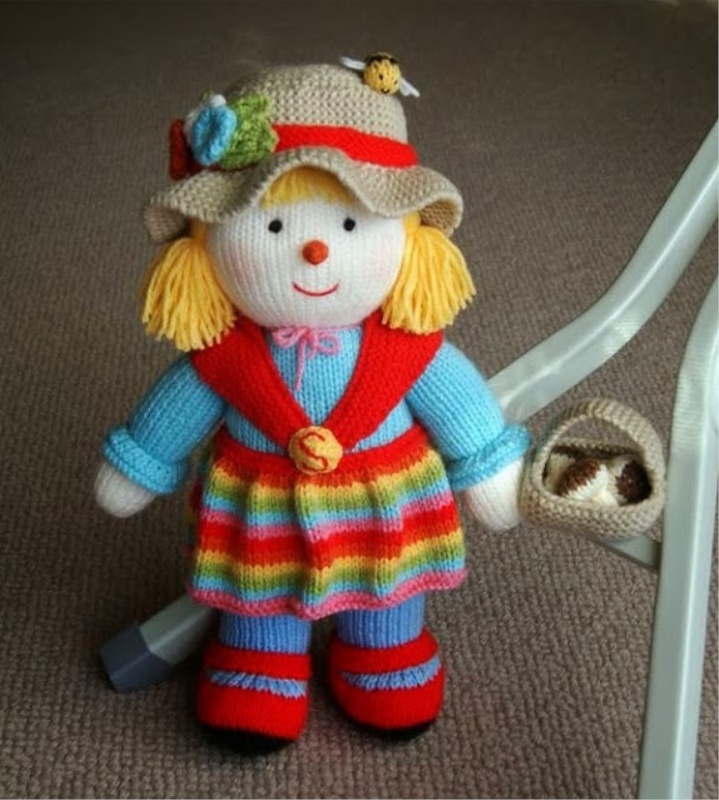 Place the hat on the doll, sewed on the place of stitching the sidewall with the fields to the head. Sew along the ends of the rows, place on the hat along the lower edge of the sidewall, sew back, sew. For the bow, red thread to collect 30 loops and knit 3 rows of hosiery. Hinges close. seam both webs. Then sew a bow to the ribbon on the back of the hat. One - white, one - orange, one - light blue. Row 1: add 1 loop to each loop. = 10 pet. 2 and all even rows: izn. loops. 3rd row: add 1 loop to each loop = 20 pts. 5 row: 1 person., (Stretch the bottom over the right knitting needle, making a loop, 2 vm. Persons.) To the last loop, 1 person. 7 row: (2 vm. Persons.) To the end. = 10 pet. 9 row: (2 vm. Persons.) To the end. = 5 pet. Cut the thread, leaving a long end. Stretch it through the remaining hinges, pull, fasten. Tightly collect the edge of the collected loops, pull, fasten. Sew along the ends of the rows a flower from the inside. For a leaf (4 pcs.) With a green thread, dial 5 pet. Knit 10 rows of stockings. Cut the thread, pull off the remaining loops with this thread. Side of out. loops - front. Sew pair of leaves, between them on the hat lay 3 flowers, as in the photo. Beginning at the head of the bee, dial 4 pet with a yellow thread. 1 row: add 1 pet. in every loop. = 8 pet. Starting with izn. row, knit stocking 3 rows. Cut off the yellow thread, attach the dark brown. Continue to knit stocking. and yellow threads. Continue to knit with a yellow thread. Next. row: 2 cm individuals. to end. = 4 pet. knit linen. Knock the middle of the bee, tightly tightening the thread around the contour, fasten, hide the ends. white thread, make 2 air loops-wings each. doll, as in the photo. The final stage will be the final Sally. In the photo I have pins defined eyes, mouth and nose, all this will be in the last stage. red thread for the mouth is to embroider a V-shaped mouth with the lowest point 6 rows higher than the rows of the head inserts. Embroider small stitches in every corner of the mouth. Cut 2 pupils out of black felt and 2 eyes out of blue felt. Fold in pairs, keeping the lower edge of the pupil and eyes at the same level. Glue the eyes at a distance above 2 cm from the upper corner of the mouth at a distance of 2.5 cm from each other. Orange thread dial 6 pts. and knit stocking knitting 2 rows. Reduce 1 loop at each end of the trail. row and every trace. even rows. = 2 pet. Pull off the remaining hinges. (I made potatoes, I just like it more). nose at the ends of the rows. Turn out there, fill. Sew on the edge of the collected loops to the face. For the bangs, sew a few loops of yellow thread and fasten it above the eyes. Cut the loop fold to get single strands of hair. For the rest of the hairstyle, cut the threads 100 pcs. 33 cm long. the front of the assembly line head, the other - above the neck, having the middle braid head . Sew a straight line to the head with simple stitches. Tie tails on both sides of the head at nose level. Fluff the ends of the tails. then she cut the bangs and that's it. You decide how you will do it. Who knows a different way, please share the experience). Red thread dial 80 pet. Knit garter stitch, diminishing at each end of the row of 1 pet. Turn off every trace. 2nd row until there are 2 loops. Cut the thread, pull 2 ​​loops. Spread the shawl over the doll's shoulders with the side with a looped edge to the neck. Sew the ends of the shawl at one point in front on the chest at the top of the skirt. can probably make reductions in each row, or even at the beginning and end of the row). Yellow thread dial 20 pet. knit 1 row of facial loops. Track. Row: (2 in. izn.) to the end. = 10 pet. Knit 1 row of persons. Track. Row: (2 in. izn.) to the end. = 5 pet. Cut the thread, leaving the long end, stretch it through the loop and pull it tight. To fasten. Sew a brooch at the ends of the rows. Use a red thread to sew back the letter S with a stitch. Then, continue to sew the letters back and forth on empty spaces. Sew a brooch, closing the attachment point of the ends of the shawl. Light blue thread to make a 20 cm long cord of double thread. Tie knots at the ends. Tie a bow and sew to the doll in the middle of the neck. All parts knit in 2 threads of different shades of beige. Knit 18 rows of garter stitch. Hinges close. Dial 44 pet. and knit 8 rows garter stitch. Hinges close. Sew along the ends of the rows all parts. Sew the edge of the closed sidewall loops round the bottom edge. Sew the ends of the handle to the edge of the gathered sidewall loops. Sew a pen to the hand of the doll. Brown thread to collect 8 pet., Without tightening. 1 row: increase in each loop. = 16 pet. Cut the thread, attach the cream. Knit 6 rows of stockings. Track. a row: (2 vm. persons.) up to the end. = 8 pet. Cut the thread, leaving a long end. Stretch it through the remaining hinges and tighten. cap along the ends of the rows, turn it onto the right side and fill it tight. Twist the leg across the width of the blade and sew a number of ends in this position. Push the edge of the closed hinges of the legs over the edge of the gathered hinge hinges inside the cap. Secure the foot in this position.